Well this kit is really building itself I'm just sat back with a cup of tea! The hull is now almost done, all I need to add is the Belgian specific wing mirror mounts and mirrors (which are Leopard 1 types by the way) and add the gun travel lock once the turret is built up. Only a few additions or improvements have been made namely brass handles, a tube for the engine bilge pump outlet and new front mud flaps as the kit supplied vinyl ones are pretty useless. Really enjoying this at the moment, the fit of parts is first class and the details are great. Now it's turret time. On the Stonehenge Modellers front we've just had confirmation that we have tables for the IPMS Belgium plastic & steel national convention in October. I'm certainly thrilled to be going to this show and even more excited to be exhibiting! Should be a great weekend and I look forward to maybe meeting up with all you European guys who follow the blog if you are attending the show. Here is the Mk1 male tank after a rather quick chipping session. I used a very fine brush and a needle with water to add the scratches and chipping on the model. I had to restrain myself though as you know how much I enjoy this process! Looks rather good and further weathering will tone it all down nicely. 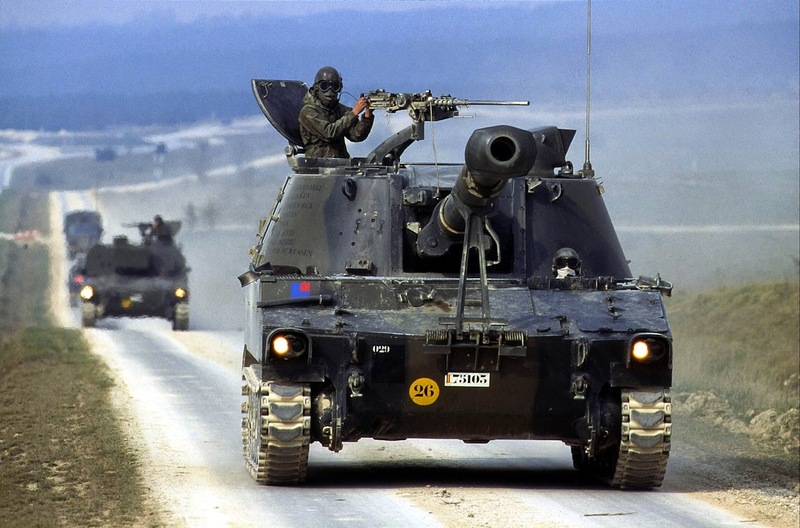 The M109 has also been started and so far no problems with it. The hull is made up of multiple parts so I used the upper hull tops to make sure it was all square whilst gluing it all together. They are just test fitted here. The wheels are very nicely cast and the suspension arms are workable too. The male tank has also had some attention and the main painting finished off. For this I first sprayed a couple of coats of AK worn effects over the model then once dry a coat of tamiya flat earth followed by a couple of progressively lighter shades using buff and desert yellow mixed with the earth colour. I've kept it very light as I don't want the finish to darken too much especially in this scale. Once the paint has dried over night I can start adding some scratches using a cocktail stick and very fine brush. I don't want to go too heavy on this but rather add just enough wear around the obvious areas of the model. Well it's all go in the cave at the moment, this afternoon I've been attacking the stug with the vallejo modulation set. Very impressed with the way the paint sprayed going on as it did lovely and smooth. I also like the depth of colour. Also I found that a little goes a long way so I have plenty of paint for a few more models I think. I'll let this dry overnight then paint the interior and then varnish the whole thing. Here's my next project, as if I haven't got enough on the go at the moment! 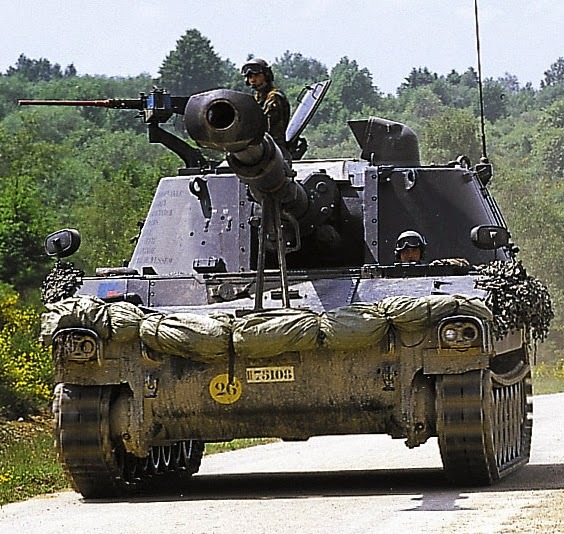 It's AFV club's M109 which I will be building as a Belgian version. I've been itching to start this for some time and as the chieftain project is nearly completed I wanted to get on with it before anything else sidelined me. The Stug & Mk 1 tank will be painted up in the next few days so I have a need to start gluing stuff together! Should be a fun build this, I plan on using either metal or plastic replacement tracks given my record with AFV club tracks and will alter some american crew figures to Belgian standards of uniform. Chieftain Base Part 4, The Final Push! Well I've pretty much got the base how I want it now and just need to add a few damp areas once the models are in place. I added some dried herbs in the end around the bushes for leaf litter then painted up a couple of old beer cans. I went for a castlemaine 4X & heiniken as they fitted the late eighties scene nicely. A nice rusty can finished off the area around the bushes. The Crossing posts had an application of raw umber oils for the wood colour then some fading on the metal caps followed by some metallic chipping and bird poo! The wet look I wanted to achieve did not look very convincing and to me at least just was not right. In the end I sprayed on some matt varnish to rectify this and I think it looks much better. Here's a test fitting of the models on the base. Third instalment now and I've got the colours on and added some tonal variation to the grasses and tufts using dry brushed oils. I've kept the grass deliberately dark as the scene is set in winter so the grass would be almost dormant, not fresh and vibrant like say in spring. I'm going to attempt to get a damp if not wet look to the mud and road surface on this one as this will tie in nicely with the chieftain. I just need to work out how I will go about it!